Who says you can only eat cereal for breakfast? 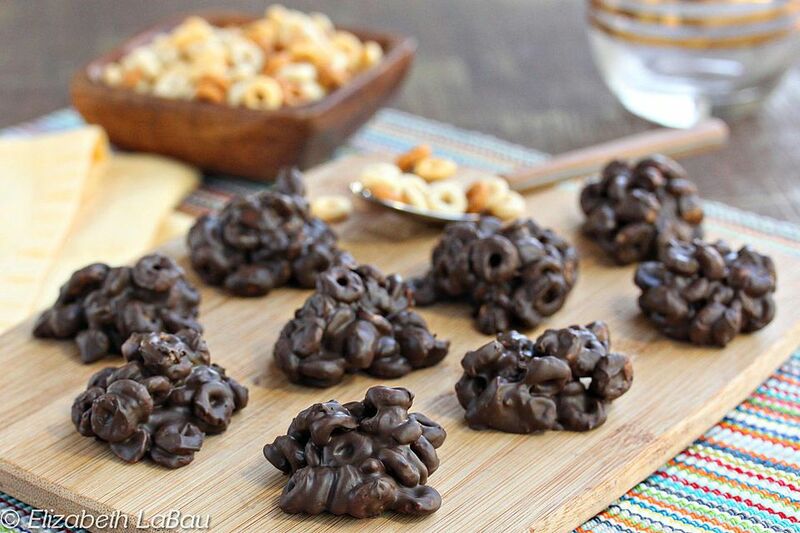 Cheerio Clusters are good any time of day! These easy drop candies have a light and crunchy texture (thanks, Cheerios!) and an intense chocolate flavor due to the combination of 3 different chocolates. If you want to simplify the steps and ingredients, you can also replace the 3 chocolates with 11 oz of just one type of chocolate (dark, milk, or white). I love adding peanuts to my Cheerio Clusters, but you can mix it up by adding whatever nuts you like. You can also try throwing in a handful of dried fruit, like cranberries, raisins, or chopped dried apricots! Using a large, sharp chef's knife, finely chop the unsweetened chocolate, semi-sweet chocolate, and white chocolate. They should be in equally sized pieces, smaller than an almond, for fast and even melting. Combine the chopped unsweetened chocolate, semi-sweet chocolate, and white chocolate in a medium microwave-safe bowl. Microwave in 30-second increments until the chocolate is melted and smooth, stirring after every 30 seconds to prevent overheating. Once the chocolate is melted, smooth, and a uniform texture, add the cheerios and peanuts. Stir them in with a spatula, until the cereal and nuts are well-coated in chocolate and no dry spots remain. Use a small candy scoop or a teaspoon to drop small spoonfuls of the candy onto the prepared baking sheet. (Alternately, you can drop them into small paper candy cups to make them easier to serve!) While the chocolate is still wet, decorate the top of each cluster with chopped nuts, a white chocolate chip, or dried fruit, if desired. After all of the candies are formed, refrigerate them until the chocolate is completely set. Store the candies in an airtight container in the refrigerator for up to a month. For the best taste and texture, let them come to room temperature before serving. Click Here to View All Cereal Candy Recipes!